While that may seem prudent, and is in some cases a necessity, there's an equally valid argument that periods of economic downturn, real or perceived, are the perfect time to invest. At Presteigne Broadcast Hire, we take the latter view, which is in part why we have just added to the 40 million GBP in inventory we already carry with a further investment of more than 2 million GBP in new broadcast technology to service customer demand when the funds available for permanent in-house stock are perhaps being increasingly squeezed or diverted. And therein lies the rub. Broadcasters and production companies are expected to maintain, in fact, improve traditional standards of quality and production, a pressure further exacerbated by the heightened consumer expectations of HD, 4K and, soon, perhaps beyond. 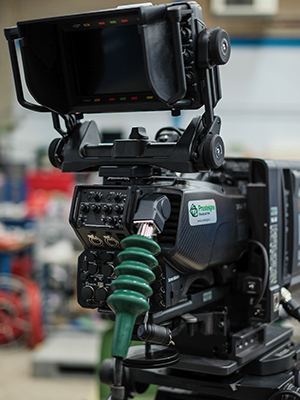 We aim to not only facilitate the maintenance and improvement of existing and future standards, but act as the enabler by providing ready and affordable access to proven technology that spans the range from, well, almost from spanners to the latest 4K, ENG and telephoto lenses, plus everything in between. This is not a decision that was taken lightly, but was born of careful study of the marketplace, both now and for the near-term future. It can be difficult given the rapid changes in technology - and expectations - over the last decade or so, but that's where our experience of having been in the hire business for more than 25 years emerges as a considerable value-add for our customers. We have a very good idea of what they need, and equally, where and when they are going to need it. Our job is to make sure they can get what they want, anytime, anywhere, and know that it will be precisely what is required, precisely when and where it is needed. Sometimes, we have to steer their ship down a slightly different channel, but that's because we've been down that particular river many times before and know where the sandbanks are. Not a lot of others have that ability to be so responsive with the right kit at the right time. What gave us the notion to make such a sizable investment in somewhat uncertain economic times is related to a major change in our business in recent months, in that we have taken back control of our finances and expenditure in the form of an MBO. It's something I've long wanted to do to free up the capital required to provide the kind of flexibility, service and, ultimately, technology that at times in the past we were occasionally hard-pressed to keep up with overall. Those days have now changed forever. If we don't have it, we can get it, and quickly. In addition to our existing inventory, we now have an incredible range of broadcast technology from Sony, Canon, Blackmagic, Vinten and many others that alone demonstrates our commitment to our customers worldwide. One of the most important tasks for a dry hire company is to plan and budget for new technologies, and we have studied the available choices very carefully to ensure we can meet demand with the right technology. For example, we normally expect professional lenses to have a working life of at least ten years. The demand for 4K cameras and lenses is already on the rise and shows no signs of abating, so we expect our new 4K kit to be serviceable for at least a decade and probably much longer. 4K isn't going anywhere, and of course neither are we. As 4K production becomes commonplace as a standard for motion pictures, television dramas, and live events we'll probably make additional investments, which we now have the financial freedom to do. Of course, high resolution images are wonderful, but their impact would be decidedly diminished without audio, so we've made an equally, shall we say, "sound" investment in new digital audio technology to cover everything from critical intercoms, mixers and presenter mics to ENG sound and monitoring. It's no longer enough to just farm out kit on demand. Our engineers, hire desk and support staff work tirelessly to ensure that what goes out our door is not only serviced and ready, but is in the best possible condition it can be, as well as being carefully packaged for safe transport - often to extremely far-flung corners of the world. It doesn't matter to us if we're shipping to Tanzania or Trafalgar, all of our kit gets the same care. Of course, that's the way it should be. It's what our customers expect. However, budget cuts in many corners of the industry often come at the cost of compromise.